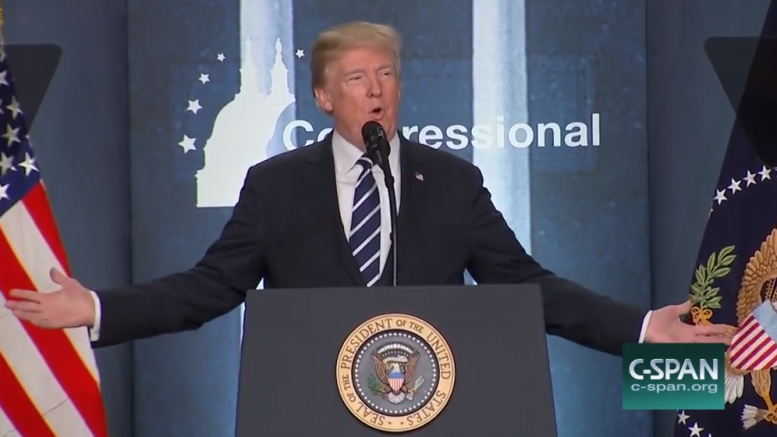 President Donald Trump today said he initially “didn’t really care about” opening the Arctic National Wildlife Refuge to oil exploration until he received a call from a friend in the oil industry, but Alaska Sen. Dan Sullivan says Trump was onboard all along. Trump told the story while giving an overview of the GOP’s tax bill during a retreat with Republican lawmakers today, explaining that he wasn’t sure ANWR would stay in the tax bill until he took a call from a friend “who’s in that world and in that business” who told him how big of a deal ANWR is, including to President Ronald Reagan. “After that, I said, ‘Oh, make sure that’s in the bill,'” Trump said to laughs. Sullivan said that the senators went into deep detail about the controversial project. “It was maps, it was on his desk, Zinke was there. And it was all about Alaska, all about Alaska issues, all about our priorities. And we talked about ANWR,” he recalled. Trump’s story, if true, would seem to diminish the role Alaska’s congressional delegation had in bringing home authorization to begin the first steps to open the 1002 area of ANWR to resource development, but there’s also the very real possibility that Trump was playing for laughs. Sullivan declined to speculate to The Washington Post on whether or not the president was trying to make legislators laugh with the story. But if you need any idea whether or not Trump was in a joking mood, just look to how he closed out the story after being reminded to thank Rep. Don Young alongside Murkowski and Sullivan. 1 Comment on "Trump said he “didn’t really care about” ANWR until industry call, but Sen. Sullivan says he cared all along"
This sounds Begich bitter. Last time I checked it was Lisa who pushed it through the committee she chairs. Sully just helped keep our bases open and thousands employed. No big deal, it will never match the one bill Begich passed in 6 years, the renaming of the Federal Court house in Anchorage. Don’t get me wrong, it’s great, but come on now…. 2018 Adults only please, kids, stay home….